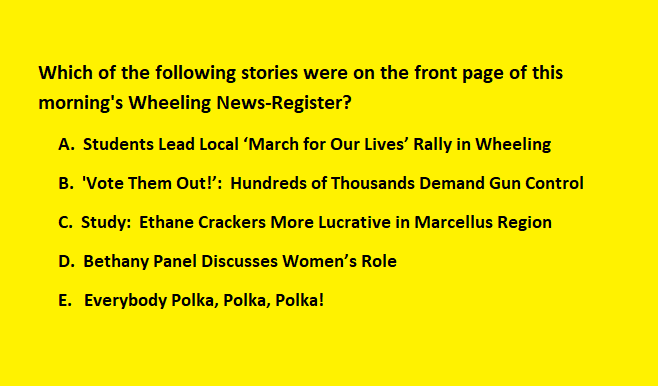 The Wheeling Alternative - What is “news” to the Wheeling News-Register? What is “news” to the Wheeling News-Register? Answer: C, D and E.
As you can see, this cross-section of the nation’s papers focused on the various marches by young people held in various cities. These protests were also a major story on the network and cable news channels yesterday as their reporters were there to bring us interviews, updates, and discussions. As a local angle to the larger story, there was also a rally against gun violence held yesterday in Wheeling. And while the local television stations in Wheeling and Steubenville covered the rally, it apparently was not considered to be news by our local “newspaper”— there was nothing in this morning’s News-Register about this rally. Why not? I've argued previously that Ogden reporters don't often work on Saturday -- an editor simply rounds up old AP stories to add to stories written days before. However, two of the stories on today’s front page occurred yesterday and a News-Register reporter wrote both of them. Obviously, that the News-Register chose to send a reporter to Bethany while ignoring a story of national importance just three blocks away says a great deal of about their biases. Back to the quiz question: neither the local nor national rallies made it to the front page of today’s paper. While the local march was totally ignored, the News-Register did print an Associated Press story on the national rallies on A5 of the front section. The Sunday paper ignored the local rally and buried what nearly every other news source believed was the biggest story of the day on page 5. Once again, their biases affected their coverage. Fear not, however, I’m sure we’re not far away from an editorial or Myer column lecturing young people about gun control, the 2nd Amendment, democracy, or all of the above.